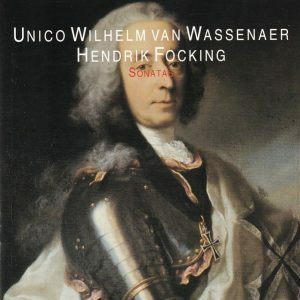 Unico Wilhelm Van Wassenaer (1692-1766), a Dutch nobleman, was famously the author of the “Concerti Armonici” long thought to have been by Pergolesi (they were attributed back to their legitimate author only in 1980). 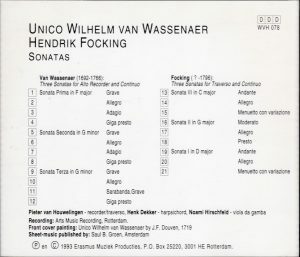 These three sonatas for recorder and continuo were discovered only in 1992 (and recorded soon after) and, with the Concerti, are the only known works of Van Wassenaer. He may have been the author of Pergolesi’s Concerti, but, on the basis of these Sonatas, he wasn’t Pergolesi, and even less Vivaldi. The Sonatas are agreeable and valuable salon music, alternating the meditative/plangent and the more lively and dance-like, but never with the melodic or harmonic invention, the moving pathos in the Largos and the uplifting boistereousness in the Allegros, of the greats. Even less is known of Hendrik Focking, not even when he was born (he died in 1796), only that “he was the carillon player of the Oude Kerk and Munt Tower in Amsterdam and the successor fo such famous musicians as Jacob van Eyk”, and that the three sonatas for traverso and continuo played here come from his only known work, a set of six. They provide a good match for Wassenaer’s: they are charming and inconsequential salon trifles.